[Eric Friedrich] needed to keep the wort warm enough for yeast to ferment it into beer. To solve the problem he built his own fermentation temperature controler using a microprocessor to turn some heating tape on and off. You can see the heating element embracing that diminutive fermentation bucket in the picture above. This was originally meant for keeping reptile cages warm. It costs less than similar products meant just for brewing and works well for [Eric]. A DS1820 temperature sensor gives feedback to an ATmega168 which then uses a relay to switch the heat on and off. The target temperature can be changed using a potentiometer on the board, with the setting displayed on a character LCD screen on the project enclosure. Fun. Another thought would be to take advantage of the < 60F (~16C) and Lager! And here’s me just moving it nearer or farther from the radiator (judicious deployment of towels is also utilised). I am impressed. And ashamed for my recent lack of beermaking. adamZ has it right, the “tradition” is that in colder months you make lagers and in the warmer months you make ales. I just make ales cause I have yet to find a lager that I really like but I don’t mind a long brew time either..
That said, usually the problem is too much heat since the only thing affected by it being too cool is brew time, however if it gets too warm you increase the chances of a lot of fusel alcohols which are typically responsible for the hangover.. Cool. I like that he graphed the sensor data. I wonder how hot that tape can get? wow. i just finished building a very similar project. Arduino + Thermistors + LCD + relay = temp controlled switched 120v circuit. main difference, I didn’t etch a circuit board, i used proto. i tested all the part separately last week, but after hooking everything up (before final mounting) i haven’t had time to rewrite my code and test its functionality. Props for the woot box. Wow. I was looking in to this about 15 minutes ago. This is now on my list of things I must do. Would this be a safe item to use on a glass carboy, or should I stick with a bucket for fermenting? Did anyone else get the warm fuzzies when they saw the woot box? did this for a brewing operation a while back with heating and cooling to hold specific temps. cheap as chips but no logging option. You mentioned the overly complicated pid + triac controllers, I made a Fuzzy Logic + triac controller for an urn and thats exactly how I described it, overly complicated. 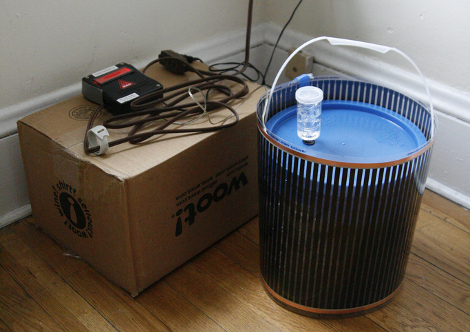 The build is up at http://www.hownottoengineer.com under my fuzzy urn project. awesome, one less thing to sterilise compared to an immersion heater! Nice quick lager yeast. I am able to finish a batch of lager in a month at 50-55F, and a few days for diacetyl rest at ~65F. That looks really cool. Would you be able to submit your project details to Hack a Day? I would love to hear more about it. I thought about doing this without a microcontroller, but my analog skills aren’t up to par. Do you have a schematic anywhere? I don’t mean to be a spoil sport but surley a fish tank heater would do the Job + be much easier /cheaper? @EricF i still have the initial design idea and calculations scribbled in a notebook and an overlay drawn on a prototype board in mspaint. dunno if any of its any use to you, lemme know if it is. btw, I wasn’t trying to be snarky in my post, you’ve got a well done project.